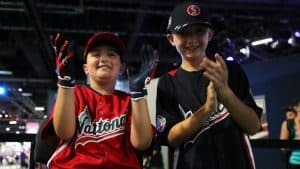 Charles Smolka, a 9-year-old from New York, made the trip with his dad to Washington D.C. for the All-Star Game FanFest this weekend. Now, he’ll be attending the MLB All-Star Game tonight after earning tickets by winning the first-ever virtual reality Home Run Derby. Everyone who attended FanFest had an opportunity to take virtual reality swings to try and qualify for Monday’s tournament. Smolka needed just one attempt to qualify. “It wasn’t that hard,” he said. Per MLB, “To be able to beat your opponent, one must launch as many home runs as possible — scoring more if they are consecutive — while aiming at “multipliers,” which were targets floating above the outfield fence that would multiply points by as many times listed.” Each player had 90 seconds to start. Over 3,000 people tried to qualify. All 32 competitors who qualified received jerseys with their nicknames on the back, batting gloves and a hat of their choice. During the tournament, Smolka made friends with Cooper “Coop” Stevenson, another 9-year-old on the other side of the bracket. They became pals and made it their mission to face each other in the final round. That’s exactly what happened. Smolka (left) pictured with Stevenson. Both 9-year-old sluggers performed well in the final round of the tournament. In the final round, Smolka faced off with Coop and they didn’t disappoint. Both players exchanged late leads in a thrilling battle. Over 120,000 concurrent viewers saw the event live on Twitch. With no time left on the clock, Smolka blasted a home run to beat Coop and win the tournament. It would be great to see other sports step up and bring fans the same type of opportunities and experiences. Looking at you, NFL. You can get a full recap of the event here. What do you think about the MLB VR Home Run Derby? Do you wish other sports or video games would make this type of technology more accessible? Let us know in the comment section below. Previous articleNew Pro Evolution Soccer 2019 Details! Frye is an experienced competitive player in multiple sports video games, including finishing 17th (NHL) and 33rd (Madden) in the 2012 EA Sports Challenge in New York City. 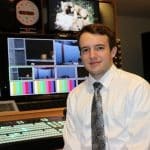 He writes about both professional and fantasy sports for other news outlets, and has a Bachelor of Arts in journalism from Penn State University. Frye has written online for over five years, and is a lifelong, die-hard fan of sports teams that you definitely don't like.